Porto is known for historic sites, nightlife, nature, museums, and shopping. Your plan includes some of its best attractions: snap pictures at Ponte de Dom Luis I, kick back and relax at Praia do Carneiro, contemplate in the serene atmosphere at Porto Cathedral (Se Catedral), and don't miss a visit to Liberdade Square. To find other places to visit, photos, traveler tips, and other tourist information, you can read our Porto tour builder site . Ottawa, Canada to Porto is an approximately 11-hour combination of train and flight. You can also fly; or do a combination of train and flight. The time zone difference when traveling from Ottawa to Porto is 5 hours. In September, daytime highs in Porto are 27°C, while nighttime lows are 15°C. Wrap up your sightseeing on the 29th (Sat) to allow time to travel to Tavira. On the 30th (Sun), enjoy the sand and surf at Fuseta Beach and then get up close to creatures of the deep with a dolphin and whale watching tour. For where to stay, traveler tips, and tourist information, read our Tavira online road trip planner . Getting from Porto to Tavira by combination of flight and train takes about 4.5 hours. Other options: drive; or take a train. Traveling from Porto in September, you can expect nighttime temperatures to be somewhat warmer in Tavira, with lows of 21°C. Finish your sightseeing early on the 30th (Sun) so you can drive to Lagos. 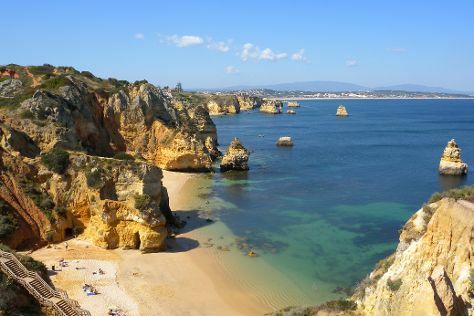 On the 1st (Mon), head outdoors with Pro Putting Garden, then take in the dramatic natural features at Ponta da Piedade, and then kick back and relax at Praia Dona Ana. To find traveler tips, other places to visit, and other tourist information, go to the Lagos vacation planner. Getting from Tavira to Lagos by car takes about 1.5 hours. Other options: take a bus; or take a train. September in Lagos sees daily highs of 30°C and lows of 21°C at night. Cap off your sightseeing on the 1st (Mon) early enough to go by car to Lisbon. Explore the numerous day-trip ideas around Lisbon: Sintra (Park and National Palace of Pena & Quinta da Regaleira). There's still lots to do: meet the residents at Lisbon Oceanarium, wander the streets of Belém Tower, don't miss a visit to Santa Justa Lift, and admire the landmark architecture of Jeronimos Monastery. To find other places to visit, ratings, and other tourist information, go to the Lisbon sightseeing tool . You can drive from Lagos to Lisbon in 3 hours. Other options are to take a bus; or take a train. Expect little chillier evenings in Lisbon when traveling from Lagos in October, with lows around 17°C. Cap off your sightseeing on the 5th (Fri) early enough to travel back home.